I should start a sketchbook devoted completely to drawings of Maddie in her dresses. Seriously! I do think I would be able to fill the entire sketchbook with drawings of her in dresses. It isn’t that she owns a ton of them…just that she would wear them everyday if she could, I do believe! I wish I had sketched her on her birthday this year…at her 10th Birthday party, playing outside in a black velvet with taffeta dress! She was running around a muddy yard, hitting a pinata, playing hide and seek with her girlfriends, and seeming as comfortable in velvet and taffeta as another girl would be in jeans and a t-shirt. Maddie and I went shopping yesterday for an Easter dress. All of her dresses from last year, though she still wears them, are really too little, especially in the length. It’s amazing how she’s growing! She gravitates to the most “flowy” dresses on the rack, preferably in blues and purples, but loves pinks and greens too. The real try-it-on test isn’t so much in how it looks on her, but rather how it feels (soft, silky and NOT scratchy) AND how much it twirls! A girl’s dress has gotta twirl or it’s no good! 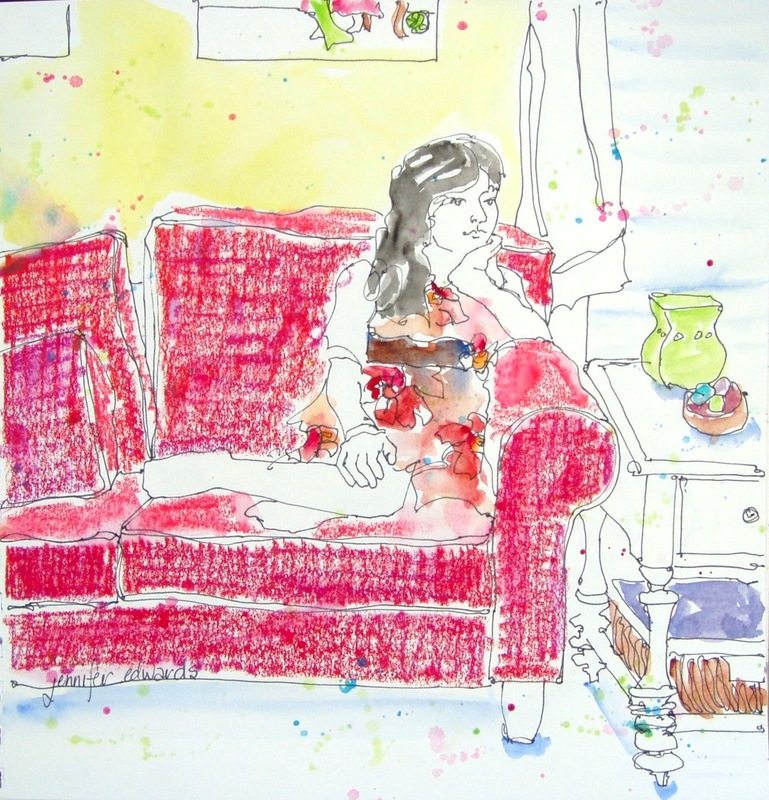 One of our favorite books we read together a few years ago is titled, The Hundred Dresses. It is the sweetest story of a girl from a very poor section of town who claims to own 100 dresses. Other girls ostracize her for claiming such outlandish nonsense. When the girl doesn’t show up for school one day, the main character goes looking for her as she feels guilty for the way she and her friends have treated her. She finds that the girl has left town with her father and, upon exploring the little shack they had lived in, finds 100 beautifully drawn pictures of dresses in the girl’s closet. I won’t tell you how the story ends…you might want to read it. I think Maddie would like to have 100 dresses, REAL ones. Of course, only if they twirl! 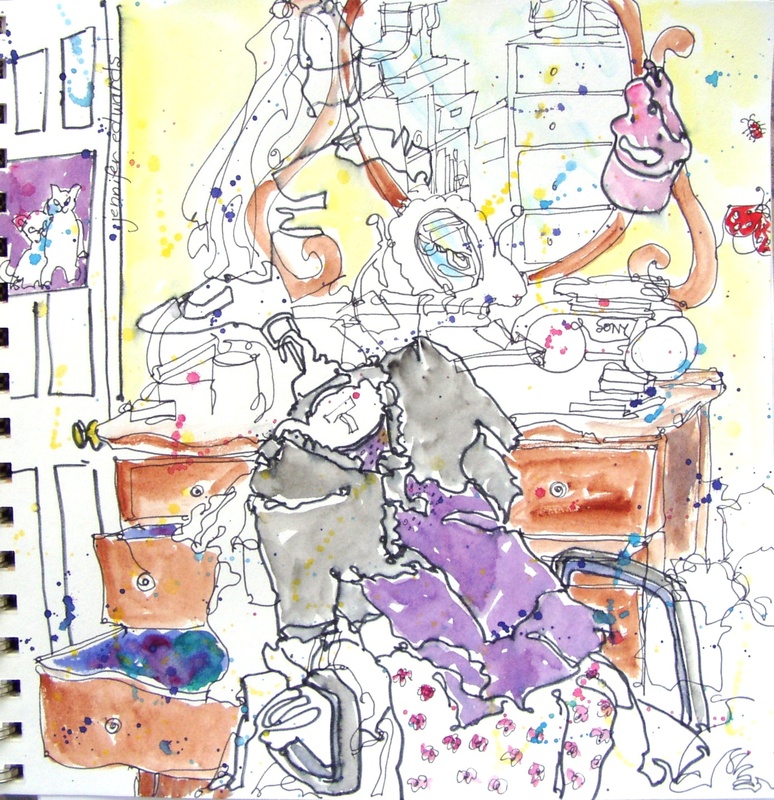 This drawing shows you one of her favorite dresses in a jumble of other dresses in her struck-by-a-super-rocket room! Spring Break this year is ear-marked for a huge cleaning out of her room and closet! We may just find 100 dresses in there that do not fit her anymore! Ha! I recall seeing another one of your lovelies twirling in a skirt on the stage!! You are so right! She was “so pretty”, wasn’t she? I share Maddie’s love of flowy, twirly dresses. Girls rule!